Base of Operations: Del Oro city. Powers/Abilities: Amigoman is a skilled martial artist. He still hears and sees visions of his Gramps, advising him and watching over him, although whether this is a genuine ghostly visitation or simply the product of his guilt and loss playing on his mind, is unclear. History: Antonio Alvarado came from a good, middle-class family. But as he grew older he fell into bad company, joined a gang, and looked like he was about to throw his life away. His grandfather changed all that. Alberto Alvarado, called Gramps by his grandson, was a retired army sergeant. He took Antonio in when the boy was fifteen and turned him around, away from life as a gang-banger, and into school work and martial arts. Antonio graduated school with excellent results, a straight "A" student, and went to college to study law. He was well on his way to becoming a successful lawyer when tragedy struck. Gramps was mugged and died shortly afterwards, a victim or random street violence. The police investigated, but couldn't find any leads, and in the end had other crimes to worry about. Determined not to let his grandfather's murderers slip through the cracks, Antonio decided to track them down himself. He quit law school and moved back home. To pay the bills, and to give himself a way of keeping his ear to the street, he became a high school teacher. And he started to use his old street contacts to try and hunt down the people who had killed Alberto. Since his pursuit of justice might take him over the line with the law, he started to wear a mask when he went out at night, prowling the street searching for leads. Although he was only really interested in finding the killers, he began to come across other crimes and other innocents being endangered, and his sense of justice wouldn't allow him to stand by and just watch. Gradually he slipped unintentionally into the role of vigilante. 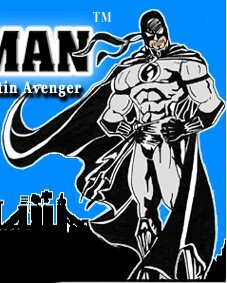 His actions stopping street crimes drew public attention, and he was labelled a friend of the city by many, dubbed Amigoman, the Latin Avenger. But all Antonio really wants is to find the men who murdered Gramps, bring them to justice, then hang up his mask and return to law school. Comments: Amigoman was created and is copyright to Anthony Oropeza. Art on this page by Lorenzo Lizana. Please check out the Amigoman website.